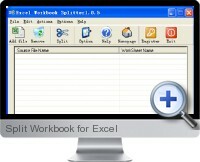 Split Workbook for Excel is a powerful and easy to use Excel tool to split multiple sheet Excel files into single sheet Excel files with high speed. Split Workbook for Excel saves time by automating the task of creating individual workbooks manually. Split Workbook for Excel also supports the processing of multiple workbooks and/or multiple entire folders, making providing significant efficiency gains in splitting workbook content into individual workbooks.